Author Evan Hughes and Fort Greene writer Nelson George will be speaking tonight at 7:30 pm at Fort Greene's Greenlight Bookstore, preceded by a literary walking tour at 6:30 pm. 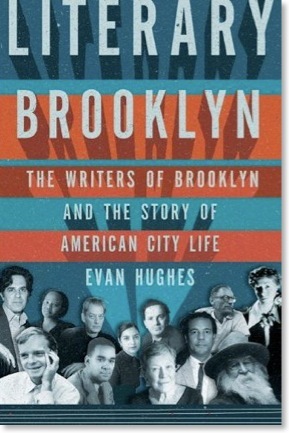 Evan Hughes's absorbing new book, Literary Brooklyn: The Writers of Brooklyn and the Story of American City Life, comes at an apt time: never before has Brooklyn prompted such buzz as the home of writers, thus leading to sweeping, if not necessarily cogent, suggestions of brough-related creativity. There is no "Brooklyn school" of literature... One experience Brooklyn's writers have shared, however, is living just outside the colossal, churning center of the metropolis.. Some have used all their might to make the scape from impoverished Brooklyn neighborhoods.. Other writers have chosen Brooklyn as an escape from the commercial clamor of Manhattan. Part of Brooklyn's richness as a site of the literary imagination, I think, lies in the very fact that it is not only a truly distinct place from Manhattan but a less exceptional one, it he strict sense of the word. More human in scale, less visually extravagant, not so wealthy or stylish, more suspicious of what is fashionable or famous, slower to hunger for the new new--Brooklyn is more like America. That surely was so during the time of "February House," the notorious 1940s Brooklyn Heights lair for the likes of Carson McCullers, who treated Brooklyn, in Hughes's words, as a "treehouse with a Manhattan view." Today, Brooklyn may still trail or differ from Manhattan in certain ways, but it certainly hungers for the new--and even gets tweaked for that. And, curiously enough, while Brooklyn houses some very buzzy writers, some pictured on the cover, as Dwight Garner's positive but savvy 8/17/11 New York Times review observed, barely make the narrative, since they don't write about the borough. The discount from Manhattan is a common first impulse for writers to move to Brooklyn, and it has been for a long time, though the gap in expense has narrowed. But then, so often, a deeper relationship with the place takes hold. And when I get curious about a place, which I quickly did about Brooklyn, I want to know, What are the great novels or poems or memoirs about this place? Who are the key writers? And what portrait of the place have they created over time? Hughes, in this self-described "hybrid of literary biography, literary analysis, and urban history," suggests literature can "offer an intimate view of a very particular place and time." So he takes us through the urbanizing world of Walt Whitman; the making-it (or not) fever captured by Daniel Fuchs, Alfred Kazin, and Bernard Malamud; Richard Wright on the great migration; Arthur Miller on post-war capitalism; Norman Mailer's counter-culture impulses; and Pete Hamill's neighborhood evocations. He offers worthwhile details, noting that today's seemingly genteel streets of Brooklyn Heights, graced by plaques commemorating literary history, were rough and poor, as was the Seventh Avenue of Hamill's boyhood Park Slope. It is a strain of thinking that runs through Kazin and Malamud and [Thomas] Wolfe] and all the way back to Whitman. For them, a belief that survives all anger is the belief that culture is a life-changing force, that the shared struggle for meaning, accreting over decades and centuries, provides an irreplaceable "spiritual sustenance." The latter section of the book covers the urban crisis and Brooklyn's buzzy revival, including Hubert Selby's grim dystopia, L.J. Davis's acid portrayal of early gentrification, Jonathan Lethem's more expansive accounts, and Paul Auster's and Nelson George's neighborhood evocations. 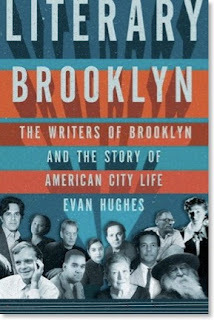 As noted in the Times review, authors like Jhumpa Lahiri and Jennifer Egan get pictured on the book's cover but hardly a mention in the book; they live in Brooklyn, but like other celebrated Brooklyn residents, including Jonathan Safran Foer and his wife Nicole Krauss, Rick Moody, and Susan Choi, don't write about Brooklyn. Who does? Hughes does cite historical novels like Emily Barton's Brookland and Elizabeth Gaffney's Metropolis, as well as Colm Toibin's Brooklyn and the work of Edwige Danticat. As for life in the last 15 years, he mentions Amy Sohn's "light romp" Prospect Park West and Joanna Smith Rakoff's "comedy of manners" A Fortunate Age, as well as Keith Gessen's All the Sad Young Literary Men and Michael Thomas's Man Gone Down. Today's Brooklyn, Hughes suggests a bit speculatively, has many more "a room of one's own" than Manhattan, as well as providing "today's nexus" for literary interactions, as once did Greenwich Village. Actually, there's a bit of a scale difference. Brooklyn can't equal Greenwich Village, but maybe Fort Greene and Park Slope could be parallels. But he's right to point out that independent bookstores, as well as the Brooklyn Book Festival, suggest a flowering today. I'd say it clearly goes with an increasingly educated set of residents. But you’d have to be a bit dense to confuse a geographical and economic accident with an aesthetic movement, no matter how sick you are of hearing about how green the grass is over here, no matter how much you long for that nurturing Elysium of your dreams. Yes, the book is a selective reading of a plethora of literature, but I would have appreciated some mention of the lesser-known fictional works that have addressed changing Brooklyn, from Thomas Boyle's under-appreciated noir trilogy to Gabriel Cohen's gentrification novel, Boombox. Also, beyond Danticat, the book says little about immigrant authors, but surely Lara Vapnyar, who lived in Brooklyn before moving to Staten Island, deserves mention for her 2003 book There are Jews in My House, which has stories set in Brooklyn. To apply context, Hughes relies on a few nonfiction books, notably Craig Wilder's essential (if not literary) history A Covenant with Color: Race and Social Power in Brooklyn and Nelson George's thoughtful memoir City Kid. He also cites Barbara Habenstreit's little-known 1974 snapshot of urban deprivation, Fort Greene, U.S.A. I'd suggest consideration of some ambitious nonfiction works that fill out the portrait of contemporary Brooklyn, such as Samuel G. Freedman's Upon this Rock: The Miracles of a Black Church, an intimate portrait of an East New York community; Greg Donaldson's The Ville, about cops and kids in turn-of-the-'90s Brownsville; Douglas Century's Street Kingdom: Five Years Inside the Franklin Avenue Posse, a strip very different from now-gentrifying "ProCro"; and Michael Weinreb's Kings of New York: A Year Among the Geeks, Oddballs, and Genuises Who Make Up America's Top High School Chess Team, set at Midwood's experimental, immigrant-rich Edward R. Murrow High School. Beyond that, I'd add a couple of affecting books about basketball that tell larger Brooklyn stories: Rick Telander's Heaven is a Playground and Darcy Frey's The Last Shot. Maybe, even, there will be some compelling nonfiction about Brooklyn's biggest controversy, Atlantic Yards. With such distinctive writers now living in Brooklyn, surely some will train their narrative focus on the streets they see every day. The person in Brooklyn who sits on the stoop or leans out a window with "eyes on the street," as Jacobs described it, has a great deal to see. The special character of a neighborhood, the town-within-a-city ideal, the threats to that ideal, the struggles and strife, the palpable history, the diversity, the space to think and look at the sky, the social crosstalk that can be lively, harmonious, acrimonious, and absurd--all these are the makings of vivid writing, as the literary history of the borough shows. What I had wanted and found in [the conversations he observed], what I admired and adored about Kensington, was the assertion that we can rebuild and remake ourselves and our communities over and over again, in no small part because there have always been corners in Brooklyn to do so on. Which means the next contributors to the skein that is Literary Brooklyn can and will come from anywhere in the borough.